So what is Ghosh yoga, anyway? You may be wondering what the difference is between Bikram yoga and Ghosh yoga. 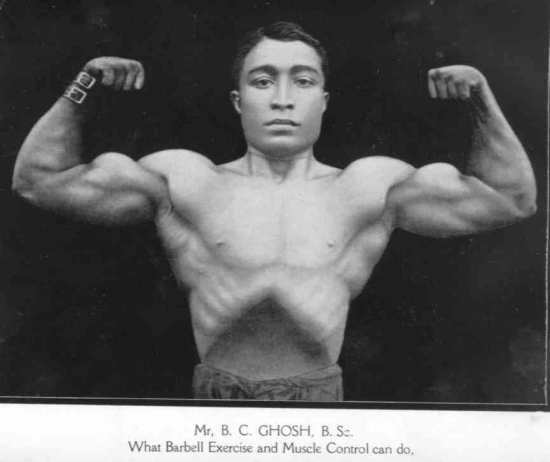 Bishnu Charan Ghosh was the originator of Ghosh yoga and was also Bikram Choudury’s guru. So doesn’t that mean that Bikram yoga is a version of Ghosh yoga?? Well, yes… uhhhh… kind of…. not completely. As with any system that has been passed down from person to person and generation to generation, evolution, additions, and subtractions and of course misinterpretations are inevitable. With that said, the yoga that Bikram teaches today is not the yoga he taught when he first came to the United States in the 1970s. Paramahansa Yogananda (his older brother), author of Autobiography of a Yogi and founder of the Ranchi School for Boys in Calcutta and the Self Realization Fellowship in Los Angeles. Professor Thakurta, the physical education director at Calcutta University. Ghosh yoga is a combination of the 84 asanas of the” Yogoda” system taught by Yogananda at Ranchi and the physical education techniques taught by Professor Thakurta which included weight training and calisthenics. Notable students of Bishnu Ghosh include Buddha Bose, Monotosh Roy, Nilomi Das, Bikram Choudhury and Biswanath (Bisu) Ghosh ( Bishnu’s son and Bikram’s best friend). If you ask Tony, he will tell you that he has always practiced to the best of his ability but in my opinion, his practice is extraordinary and far exceeded that of the yogis and yoginis with whom he studied and practiced. Over time, Tony achieved great success in his career and as he did, drifted away from Bikram. In 2005, Tony and his wife Sandy moved from California to Baja Mexico where Tony started the Yoga Physical Culture Academy. This is A LOT to explain! (More reason to come take my class 🙂 ) Instead of going into the details of each of these concepts, I simply want to pose the question of why? Why have these changes occurred? Well, there are many people in the Bikram world and many voices expressing their own interpretations. But I think the main reason so many things have changed over the last 40 years is because the Bikram Beginners Series is just that: a beginner’s series. It is not a comprehensive, life long, work the whole body system. It is a gateway into the world of Ghosh yoga. Yet it has been deemed as the one and only system you will ever need. In order for the 26 postures and 2 breathing exercises to actually be a holistic system, changes to the original postures had to be made. An example of this is how we use the arms in Bikram vs. in Ghosh yoga. The 26 postures in Bikram yoga are not very upper-body focused, aside from wind-removing pose and half locust post. Arms are used in the other 24 postures, but not as a primary focus. Over the years, greater use of the arms has been incorporated into many of the 26 postures through the action of pulling and tightening the grip (as seen in hands to feet pose and stretching pose). Initially, using the body in this manor is a great thing for beginners because it awakens the upper body, opens the chest and stimulates muscles that haven’t been well used. But once you have established your practice, it is important to not over use the arms when they are not intended to be used because it will not allow the development of strength and flexibility in the areas that the postured was designed to work on, i.e. the spine, neck, shoulders and back. Ghosh yoga focuses on the efficiency of each posture, only using the muscles required by the posture without over complicating the focus. The practice of Ghosh yoga as a holistic system is starting to become more and more popular, thanks to Tony Sanchez. Bikram yoga is a great system that acts as a bridge from pain and sickness to health and wellness. Because of this, Bikram can be thought of as a type of physical therapy. Ghosh yoga, on the other hand is a lifelong, sustainable yoga practice.